Washington, May 2 (IANS) Describing security cooperation with India as “a central element of the broad US-India strategic partnership”, the US says it looks forward to working closely with the next Indian government to build on it. 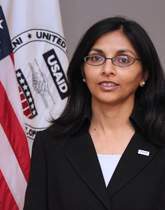 India’s “rise as a competent and confidant and capable power that advances regional stability, security and prosperity is something that the United States welcomes and supports,” Nisha Desai Biswal, assistant secretary of state for South and Central Asia told a Congressional panel. Commenting on “the incredible display of democracy going on in India,” Biswal said, the US continued to facilitate growth in India-US trade relationship and ensure new opportunities for businesses in each other’s markets. “Our collaboration on energy, science and technology, environment, space, education and counter-terrorism continues to deepen,” she said. “The improvement of relations between India and Bangladesh and the growing ties between India and its ASEAN counterparts allow for more efficient, integrated and open markets across the region,” she said. “But clearly one of the biggest obstacles to regional connectivity is India and Pakistan,” Biswal said. “We are hopeful that we will see strong leadership from both governments following India’s election,” she said. Ami Bera, the only Indian-American Congressman and top Democrat on the subcommittee stressed the need to continue to develop the US-India relationship. “Our policy in Asia is at a critical juncture, and we must reassure our allies and partners that we are committed in the region, particularly India,” said Bera.